Hiscox has leapfrogged Chubb to take first place in the commercial lines element of this year’s Insurance Times Broker Service Survey. 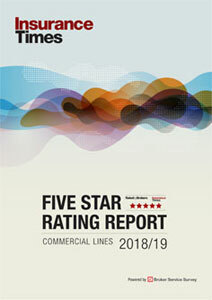 Insurers’ commercial lines service levels have improved, with the average service overall score rising by 2% year on year. AXA and MMA were the most improved insurers, with their overall service scores improving by 7%. Two insurers’ service score fell this year: Aviva and AIG. Arista was the highest placed new entrant in the rankings, finishing in joint second place with Chubb. Ten other insurers joined the rankings this year. This year, a new element – the service provided to brokers by personal lines insurers – was introduced. The results will be published at a later date. Respondents came from a broad cross-section of the broking market, in terms of geographic location, size of firm and job title. Nearly half (47%) were partners, directors, proprietors or senior managers within broking firms. The remainder were middle or junior ranking brokers or administrators, typically of claims. The backbone of the survey was the grading system used to measure insurers’ service quality. Respondents were asked to rate the service provided by the insurers they had dealt with in the past six months on a five-point scale from A to E.
Five key aspects of service were used. These were: the speed of access to decision-makers; underwriting expertise; quality of cover; speed, accuracy and clarity of documentation; and speed and fairness of claims handling. Brokers were only asked to rate those aspects of service of which they had direct knowledge. Respondents were also asked to name the company that had performed best and worst in respect of each measure, and to give reasons for their selections. The grades for each insurer were collated and a percentage score calculated for each service measure (see Methodology, below). An overall performance score – an average of the five service measure scores – was also calculated for each company. More than 50 UK insurers were rated by the respondents to the survey. These insurers ranged from the major composite insurers to smaller, more specialist insurers, as well as underwriting agencies. This year the number of underwriting agencies was expanded to reflect their growth in the market. To ensure that the results were robust, we excluded companies that were rated by fewer than 50 brokers. This left a final list of 31 companies. AXA was scored by the greatest number of brokers, with more than 300 grading the company; Aviva and Allianz followed close behind in terms of the number of respondents. The final 31 insurers were ranked according to their overall score and the results are published in the table (click the pdf link, top right, under 'Related files'). So how did the insurers perform? This year Hiscox came out top, elbowing past last year’s number one Chubb, with an overall score of 84% – an improvement of four percentage points on its performance last year. 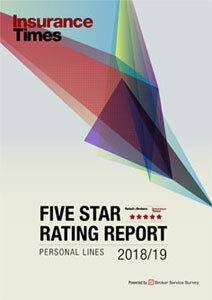 Hiscox was the top performer in claims handling and joint first in terms of underwriting expertise. Chubb, which scored 81%, came in joint second place with underwriting agency Arista. Chubb scored highest for its quality of cover, but was let down by its performance on speed, clarity and accuracy of documentation, where it came in joint ninth place. Over the past two years Hiscox and Chubb have jostled for the top spot, with Hiscox coming in first place two years ago. Arista, which shared second place with Chubb, was the top performer for two service measures: speed, accuracy and clarity of documentation (where it scored 83%); and speed of access to decision-makers (where it scored 87%). “Service levels are first class; they deliver their promises,” said another. Arista was one of 11 new entrants to the table of results. The others included Catlin, HCC Insurance and underwriting agencies Fusion and Primary. Catlin and HCC Insurance scored highly, each achieving an overall score of 79%, putting them in joint fourth place. At the other end of the table, Tradex was the worst-performing insurer with a score of 39%. It had the lowest score for every service measure. Second to last was Quinn Insurance, with a score of 48%. AXA insurance, which was commended by many brokers for its efforts to improve its service, was the most improved insurer (along with MMA), increasing its overall score by seven points. More than 70 respondents said AXA was the most improved insurer. “From zero to hero. Traditionally shocking general commercial service has suddenly altered,” said one AXA broker. Unfortunately, AXA’s effort still left it near the bottom of the table, in 29th place with an overall score of 58%. “AXA is getting better but it started at the bottom of the pile and has a long way to go yet,” noted one broker. Other insurers that improved their scores from last year included NIG (up 6 points); and Markel, RSA and Towergate (each up 5 points). Only two insurers saw their scores fall. Aviva’s overall performance deteriorated by one point to 63%; and AIG scored 68% – down three points on its performance last year. Aviva divided opinion among brokers. While some professed to be very happy with the company’s service, products and appetite for business, others took the opposite view. In the analysis each grade was converted to a numerical score. For each A, we awarded 5 points; for each B, 4 points; for each C, three points; Ds scored 1 point; and Es were given zero points. For each insurer, the scores for each measure were added up and then divided by the number of brokers awarding them to determine an average score. The average score was then multiplied by 20 to determine the percentage score for each aspect of service. If, for example, 10 brokers awarded Acme Insurance two As (5+5 points), three Bs (4+4+4 points), two Cs (3+3+3), two Ds (1+1 points) and one E (0 points) for underwriting, that would give 33 points. Dividing by those 10 brokers would give an average of 3.3 points and (multiplying by 20) a percentage score of 66%. Finally, an overall performance score was calculated for each company by averaging the scores for each of the five individual service scores.